With so much of its human past scattered in plain sight across the landscape, New Mexico offers the casual day-tripper and more serious archaeology buff an amazing range of sites to visit. As the poster child for ancient ruins here and a UNESCO World Heritage Site, Chaco Canyon stands with sites like the Egyptian pyramids, Stonehenge, and the Great Wall of China for its uniqueness and its high levels of political, economic, and cultural development. For decades, the canyon’s breathtaking monumental public architecture has drawn visitors from around the world. It is, of course, a must-see—but there’s much more to Chaco Culture than the Canyon. 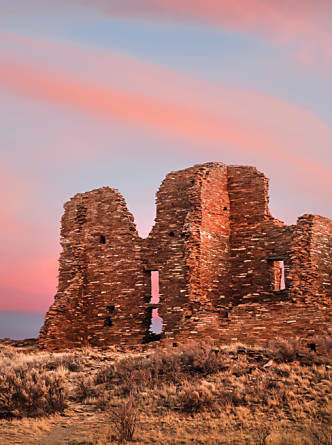 Less well known but equally captivating, the so-called Chaco outlier sites deliver an off-grid foray into the world of the 11th-century Ancestral Puebloans, without such amenities as the Visitors Center and paths that make Chaco Canyon accessible to 40,000 visitors a year. Researchers believe that Chaco Canyon was intimately related to 75 other settlements in a single cultural web flung across 30,000 square miles and reaching into Colorado and Utah, all tied together by a network of ancient roads. These sites might be remote, but anyone with a map, a taste for backcountry rambling, and a rugged, high-clearance 4WD can explore a few of them in a day or over a leisurely weekend. In exchange for expending a little extra effort in getting there, the Chaco outliers reward you with the sense of unmediated adventure and discovery that drives archaeologists into the field in the first place. A sample trio of sites that begins a couple hours from Albuquerque—Guadalupe, Pueblo Pintado, and Kin Ya’a—opens a window on the fascinating architectural magnificence, the luminous high-desert environs, the social complexity, and the unresolved mysteries of the Ancestral Puebloan culture that once centered on Chaco Canyon. Classic yet distinct, these ruins reflect the grandeur of Chaco culture, and make for an intriguing road trip into New Mexico’s remarkably accessible deep past. People began settling in the Chaco Canyon area at least as early as AD 500, carving out a living in below-ground pit houses, the likely antecedents of the more elaborate kivas that persist among Pueblo peoples today. These Ancestral Puebloans—the modern Pueblo peoples trace their lineage directly to them—built a room block where the magnificent Pueblo Bonito would eventually arise in the Canyon in the 800s. Over the next 300 years, the people of the greater Chaco Canyon region developed increasingly sophisticated architecture and a complex culture that peaked by the early 1100s, then declined as a multiyear drought gripped the region. The people moved away, eventually to the Pueblos we know today along the Río Grande in western New Mexico and in eastern Arizona. Eric Blinman, director of the New Mexico Office of Archaeological Studies, says the culture and the “regional consciousness” characterizing it began in the ninth century (and perhaps earlier). By the early 11th century, the culture had developed what he calls a “marvelous ceremonial landscape” with monumental architecture, a web of roads, and earthworks. “Central Chaco Canyon really functions as a central connector for this whole area until the 1130s,” Blinman says. “After that, it remains central in a spiritual sense, but drops off as a geographic center.” Smaller groups of families occupied outlier sites and the central canyon buildings well into the 1200s, and probably shared them later with Navajos. Archaeologists arrived at the notion of Chaco as a pivotal hub in a sprawling network of communities in the late 1970s, after aerial surveys revealed the surprising extent of roads, up to 30 feet wide, that linked them. Other patterns emerged, too. For instance, all the outliers had great houses. Though varying in size, they share a more formal layout than nearby residences, a high standard of intricate masonry work that follows the distinctive Chaco patterns, and compass-point orientation. Other common features include prominent siting and a ritual landscape defined by kivas, a plaza, and such earthwork features as berms and roads. The Ancestral Puebloans also consistently settled near water, either a permanent source or, at least, a frequently flowing wash. They developed irrigation-control systems, capitalized on natural rain runoff to grow crops, and harvested a variety of native plants. Near the great house and plaza, Toll says, the people built smaller, “less organized but Puebloan structures presumably for families, with more ad hoc architecture,” including room additions and remodeling over the years, pit structures, living rooms, and storage rooms. Press for details about how these people came together and why, though, and the conversation drifts into speculation. For decades, archaeologists have debated about the society that created the structures. “You get huge differences of opinion about how elite and powerful the people living in the canyon were, and how egalitarian or hierarchical the culture was,” says Toll. He thinks the people moved back and forth between locations, perhaps because they exhausted the resources in each spot. Local growing conditions and water availability might also have spurred migrations, as people shifted between temporary homes. You’ll see all the distinctive outlier features at Pueblo Pintado, an isolated nugget of Chaco Culture National Historic Park near the tiny hamlet of Pueblo Pintado, about 16 miles east of the Canyon proper. In their largely untouched state, the ruins typify the mute testimony facing archaeologists at these sites, especially before the digging begins. Perched on a slight knoll clearly visible from the highway, Pueblo Pintado features an L-shaped great house from the architectural heyday of the late 11th century. The three-story building encloses a plaza and four kivas. Another 14 buried kivas, a great kiva, and two road segments mark the site. Its tumbledown, silted-in state reinforces the sense of discovery you get visiting these places, as if you’re the first visitor in eons. A short dirt road through a vast rolling plain of sagebrush and bunch grass delivers you to the site, which was occupied between AD 900 and 1250. “The community here was just fantastic,” Toll says. Walls of finely crafted stonework loom above the parking area. Adding to the mystique of the place, he explains, the builders hand-carried the stone, the timber for vigas and latillas, and much of the pottery from many miles away. These folks had no beasts of burden, no wheel. They shaped the stone with stone tools, mixed mud mortar and plaster, and painstakingly constructed these imposing structures to precise measurements. Toll can’t say how they planned, laid out, and erected these complex buildings—the Pintado great house rose to three stories and had more than 130 rooms. Its straight-edge windows and perfectly circular kivas pay high tribute to human ingenuity, the primacy of craftsmanship, and an ancient culture’s ability to organize labor and feed its workers in an arid climate. Crops of maize, squash, and beans, which the people irrigated with water diverted from the adjacent Chaco Wash, once surrounded the place. Everywhere at this site, you’ll crunch over pottery shards in varied styles. Stone tool fragments mingle with the pottery. You could stare at the ground by your shoes for an hour, just studying the archaeological fragments. To an amateur, it’s like seeing someone’s house after a twister has struck, minus the drama. But to someone like Toll, the scattered debris looks like science waiting to happen; archaeologists have done little excavation at Pueblo Pintado and most of the other outliers, which undoubtedly conceal a few more clues to the puzzles of Chaco Canyon, the exact nature of its relationship to the outlying communities, and the mystery of its eventual downfall. From Pueblo Pintado, you reach Kin Ya’a down some 40 miles of Navajo Route 9 and New Mexico 371 to Crownpoint, about 25 miles southwest of Chaco Canyon. Behind a gate with a “no trespassing” sign, a deeply rutted dirt road leads a mile or so off the highway to Kin Ya’a. Don’t let the sign stop you—this is another National Park Service site—but do come in a high-clearance vehicle and beware of rain, which can melt the road into a gooey mess. Deep corkscrewing ruts testify to that. Though you can see the town of Crownpoint nearby, silence settles deeply on the land. Odds are you’ll have the place to yourself. A dramatic, four-story tower kiva dominates Kin Ya’a (Navajo for “tall house”). Other features include extensive ground-floor rooms, three enclosed surface kivas, the outline of a great kiva, and a roadway—Chaco’s Great South Road and other thoroughfares pass through here like the Big I in Albuquerque. That charismatic tower kiva commands attention. Archaeologists speculate about the purpose of Ancestral Puebloan kivas—they were probably ceremonial—but this tower might have been one link in a chain of elevated signaling stations forming a kind of ancient cell-phone network. You can certainly spot it from a long way off. Speculation aside, few would deny the beauty of the tower, its elegantly curved walls merging seamlessly into the squared outer rampart of the great house. Today when you visit, you stand atop second-story walls swallowed up by 800 years of wind-blown sand, yet the tower remains an imposing presence. Dating from about AD 1106, Kin Ya’a appeared in Chaco prime time. Soon after, the architecture lost its grand scale, the labor investment dropped, the masonry lost some luster. “Something really different happened in the 1100s,” says Toll. Maybe drought struck, maybe new people arrived—who knows? Toll has spent his near-40-year career pondering such questions. Given the splendor of the surrounding landscape, you might find the Guadalupe Ruin, south of Torreón, the most captivating of the outliers, as it looms 200 feet off the deck in the Río Puerco Valley. A 900-year-old window in the pueblo’s north wall frames imposing, square-shouldered Cabezón Peak, to the northeast. Low mesas, deep-cut arroyos, volcanic necks, and distant mountains fill the entire panorama: elemental New Mexico at its finest. Toll calls it “just stunning”—strong words from a career archaeologist. He’s been to Guadalupe many times, but the setting naturally provokes fresh enthusiasm. It’s a magic spot. Though it’s only 40 air miles from Albuquerque, the terrain blocks any view of the city. You’re on your own out here. When people say Guadalupe is remote and hard to get to, they’re not kidding. First comes the drive, the last 20 miles on dirt with a couple of seriously sketchy arroyo crossings; even after recent work by a road grader and a bulldozer, you still might need four-wheel-drive to climb out of one arroyo not far from the ruins—it’s more like a mini-canyon. From the small parking area at the foot of the mesa, follow a steep trail up, on a short hike with a mild bit of rock scrambling. Ahead and above, you’ll notice the recently installed—and jarringly contemporary—metal roofs that protect the excavated and stabilized kivas atop the mesa. Standing alone as an eastern outpost of Chaco Culture, Guadalupe includes 39 rooms and seven kivas. Archaeologists from Eastern New Mexico University excavated this BLM site years ago, then left it essentially undeveloped. With only a sliver of buildable square footage on the narrow mesa, Guadalupe rests on a smaller footprint than the flatland Pueblos. Crumbling walls, the window, and those two kivas define the site. And here’s perhaps the best reason to come: you can climb down into those kivas. Once your eyes adjust to the dim light—quite a contrast to the normally dazzling sunlight outside—you’ll see the distinctive curving benches, and in one of them, even the remnant of a ventilator shaft. Nestled into the earth and handcrafted from earthen materials about the time the Normans invaded England, the kivas viscerally evoke an ancient past that we all share deep in our genes. Unlike a museum or a clever mock-up, Guadalupe lets you touch that time with your own hands—a rare treat in 21st-century America. Its remoteness, the short but difficult trail to the mesa top, the Pueblo’s precarious perch, and the spectacular Río Puerco Valley setting—they all burnish Guadalupe’s reputation as a gem hidden in plain sight. Charles Poling is a New Mexican author, novelist, and journalist. In the March issue, he reported on the state’s hippie-commune era.